At first glance, A Place Further than the Universe may look like just another run-of-the-mill “cute girls doing cute things” anime. After all, it centers around four teenage girls who band together and, against all odds, set out on an exciting adventure. Fortunately, at least from what I can tell thus far, this isn’t some half-baked K-On! knockoff that trades the electric guitars and band practice for snow shoes and ice fishing. Instead, the first three episodes of this original production from Madhouse set the stage for what promises to be an inspirational coming-of-age adventure in Antarctica. The four main characters are well realized, each with their own intriguing motivations for embarking on an expedition in the frozen south. While Shirase’s desire to find her missing mother is undoubtedly the most compelling of the bunch, I’m curious to see how Yuzuki, a child actress who only joined the expedition because she longs for meaningful friendship, will fare on this adventure. That being said, it’s the aesthetic of A Place Further than the Universe that immediately grabbed my attention. I love its watercolor design, which is reminiscent of shows like Tsuki ga Kirei and Poco’s Udon World . It's no slouch in the animation department either, yielding what I'm hopeful will be a polished production throughout its entire 13-episode run. So yes, I fully intend to keep up with this one on a weekly basis. After the Rain centers around Akira Tachibana, a 17-year-old girl who’s fallen in love with the manager of a restaurant where she works part-time. The wrinkle to this story is that her manager, Masami Kondou, is a divorced 45-year-old man who has a son. While this could easily slip into shaky territory, the first three episodes have handled this situation with a surprising amount of tact and maturity. Masami is about as unthreatening and kind as a human being can be, serving as an awkward, out of touch dad-like figure to the youthful staff he manages. While most of his employees view him as a weak-willed goof, Akira is drawn to him for reasons she doesn't seem to know herself. Fortunately, the show doesn't drag its feet in addressing the situation head-on. By the end of the third episode, Akira's feelings are out in the open and Masami, baffled as to why a teenage girl would be interested in a boring middle-aged man like himself, is left trying to figure out how to best handle the situation. After the Rain is a visual treat that distinguishes itself from the rest of Wit Studio’s portfolio. 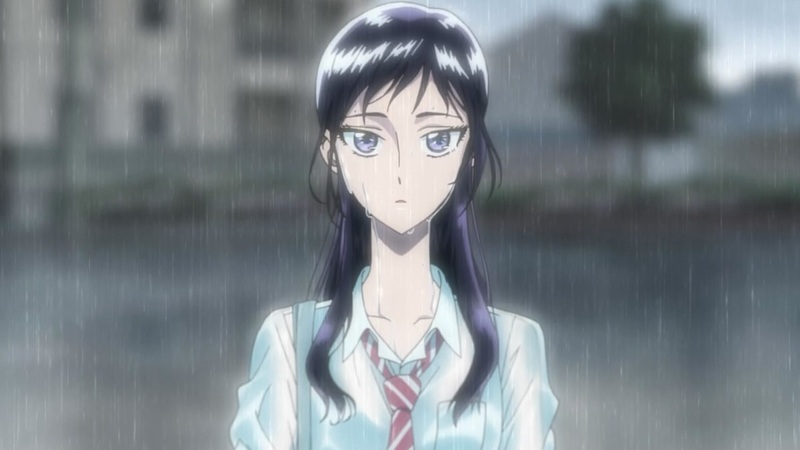 The long, slender character designs and a vibrant color palette of purples and yellows give it a distinct look, and dynamic lighting, used to great effect, often reflects Tachibana’s emotional state. It's been an innocent, endearing ride thus far, so I plan on keeping up with this one each week. Thanks to Trigger’s unbridled creativity and distinct animation style, I will never not give its latest project a look. DARLING in the FRANXX may not be a *purely* Trigger show, as the studio is collaborating with A-1 Pictures on the series, but I'm quite pleased with the the team-up from an aesthetic standpoint. While A-1's fingerprints are all over the production, Trigger's expressive touch still shines through. The fact that Masayoshi Tanaka ( anohana , your name. ), who just happens to be one of my favorite artists in the business, is the chief animation director and character designer certainly helps as well. The story, meanwhile, is a whole other can of worms thanks to a healthy helping of sexual references that are anything but subtle. DARLING in the FRANXX takes place in a post-apocalyptic future where kids, isolated from the outside world, are trained to pilot mechs (aka Franxx) to combat monstrous creatures called klaxosaurs. 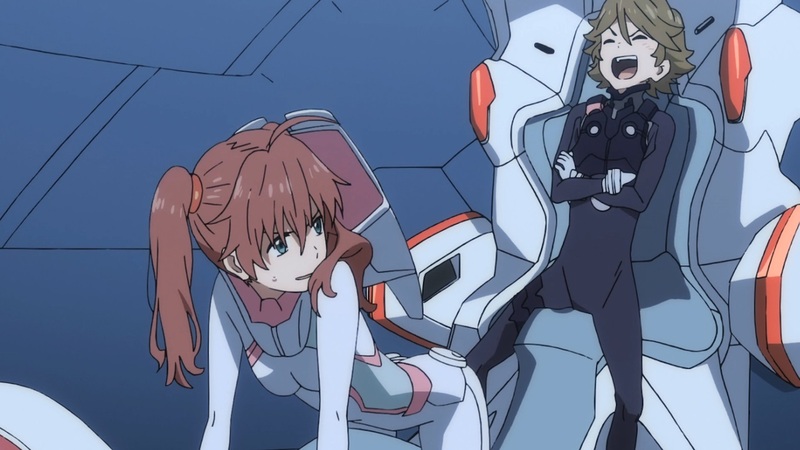 In order to operate a Franxx, a boy and girl who are compatible with one another must work together in a seemingly sexual manner so heavily emphasized it’s essentially become the focal point of the show. It’s too early to tell whether or not all the sexual innuendo is just fan service for the sake of fan service, or if it’s there to ultimately deliver some greater message. 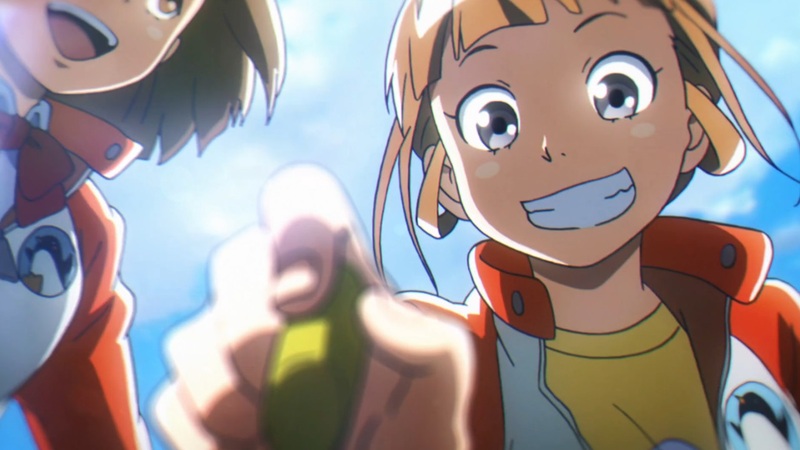 For now, I’m going to continue watching with cautious optimism and hope DARLING in the FRANXX will eventually convince me it intends to have something meaningful to say by the end of its 24-episode run.